Very nice post. I agree about the followers, it really motivates me as it does you I'm sure. Two weeks ago I had 25, now I have 50. Not sure how in the heck that happened but I'm happy about it. Enjoy this post, enjoy your blog. They said it would take maybe THREE weeks to hear back. I totally didn't get it, dude. Seriously. If they loved me they would have had me stay all day helping them. If they had loved me, they would have sent me off to see the HR girl before I left. Trust me. I also got the feeling that maybe they "try out" a lot of people. Totally bummed but trying to think of that "everything happens for a reason" crap. Well, they also have to take the time to try out others and check your references and what not. I love that waking up and realisng I have a few more hours sleep left! You'll hit that 100 mark with followers in no time! Great list. Regarding number 5, I've actually had a cutting experience that wasn't right. I had a single item and I was behind this 90 year old women with a full cart and she told me to go ahead of her. On one hand I wanted to get out quickly, but on the other it just felt wrong to cut in front of an old lady. In the end I just told her I was fine and waited the extra ten minutes. Actually, I might be the only person in the world that doesn't like getting flowers. My cat shreds them. Then I have to vacuum. Bummer. #8 really hits home for me and my hubs. I love donating time, goods, money whenever I can . It is good for my soul. What a fun list. 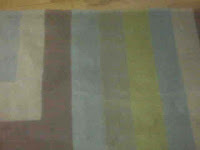 And no, #1 not sick- I soooooo know what you mean about vacuuming a rug and it looking all beautiful again! Like a little miracle! What a fun post Ally!!!! I never was a crier until I had my 2nd child. Wow! Apparently I have a lot of pent-up tears! I am following you - reaching 100 is super exciting!!!!!! 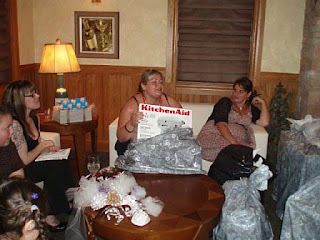 i cried when i got my kitchen aid mixer at my shower. i put that on the registry thinking no one would ever get that, but john's mom did. pretty awesome! Looks like you made 100. Congrats! Great list. I'm with you on the comments and followers thing, oh and the waking up at 3am and knowing I can turn over and go back to sleep for another 4 and a half blissful hours! At the moment I'm also loving 'Glee' (it's just started over here in the UK) and tomato soup with crusty white bread. YUM! I'm following you now and you are currently at 97! I will be pumped when I reach 100... right now I'm at like 88 (I think). And I am completely with you about liking blog comments and followers (although I really only want people to follow me who actually enjoy reading my blog... I don't follow people just to "follow them." I only follow them if I actually read their blog and enjoy it). Oh, and that hotel looked super cool! AND... I also like waking up and realizing I still have a few hours left (on the other hand, it's upsetting when I wake up and glance at the alarm clock only to discover that I have to be up in 15 minutes). Check you out! You hit 100 Followers!!! Thanks everyone for all of your input, feedback, follows and basically just being rockin' bloggers! I think I cried the first time I used our Dyson. It's like we could finally win the war on dog fur. 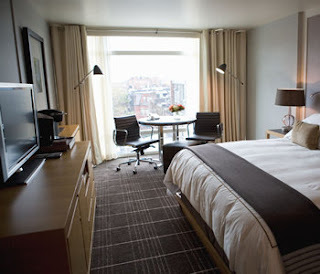 I love hotels! LOVE them! It's a bit strange but man, I could live in one forever. I also love commenters! It feels good to get them doesn't it? Great post, especially the freshly vacuumed carpet. I hate cleaning but love the feeling of a clean carpet, mostly cuz I walk barefoot through the house. Anyway, congratulations on the followers!